When regular hand soaps won’t cut it, you need a heavy-duty hand cleaner that gets the job done. With the power of pumice particles, Lava Bar soap scrubs away dirt and grease while leaving your hands feeling smooth. 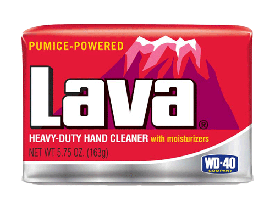 Lava Soap’s pumice cleaning power is used by mechanics, DIYers, professionals, hobbyists,gardeners, and more to quickly break through grease, grime, glue, goop, dirt, tar, oil, sap, paint, and anything that can collect on your hands while working on projects.